Gentle, patient detangling is provided for hair that is matted, tangled and knotty. Extreme care is taken so that little to no cutting is necessary. What is the number complaint about hair salons? That's right--the WAIT to get your hair done! That's a thing of the past at Salon Balisi. That said, please view the following information to help ensure that your salon time is enjoyable and time-efficient. Thank you in advance for respecting the privacy and time of other guests. Our waiting area is reserved for guests waiting to be serviced. For the convenience and courtesy of all, please avoid bringing or inviting any guests to your appointment. 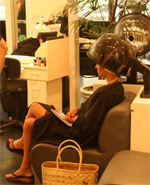 The Salon Balisi environment is one of relaxation and service. For the sake of safety and peace, we do not encourage children without appointments in the salon. Proper hair preparation and care is one of the hallmarks of Salon Balisi. It could mean the difference between healthy hair and broken, damaged hair. Proper hair preparation is never rushed. This includes shampoo, condition, comb out, de-tangling and/or blowouts. Up to 30 minutes of your service time is dedicated to hair prep. This is even more important for chemical services, which require additional time to ensure proper rinsing and neutralizing. Hair should be free of braids, twists, weaves or tangles of any kind prior to appointment. If you don't feel comfortable de-tangling your own hair ahead of time, detangling services are available. 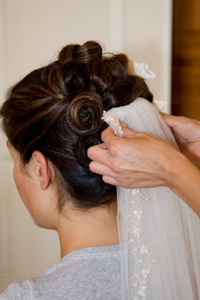 Since unprepared hair will require additional time, please let your stylist know your needs in advance. We offer the courtesy of an instant confirmation email, as well as a reminder email AND a reminder text 24 hours in advance of your appointment. If by any chance you do not receive either, please call 404-457-2509 to ensure that your appointment has been received. Please check your confirmations and reminders for errors, as well as make note of the appointment details you booked to ensure arrival at the proper time on the proper date. Late arrivals are subject to additional fees. If you do arrive late, please remember that your service must end on time in order to avoid delaying the next guest. A late arrival could result in rescheduling to another time and/or day and late charges will be assessed. Your Salon Balisi stylist consistently makes every effort to be prompt for your appointment, and appreciates the same courtesy. Our scheduling timeframe is designed to allow sufficient time to complete your service. If you are running late for your appointment, the courtesy of a phone call or text is very much appreciated. However, please be aware that doing so does not excuse your tardiness. All appointments are guaranteed and this benefit only works with the cooperation of all clients. Please allow sufficient time to arrive promptly for your appointment. Due to Salon Balisi’s one-on-one structure, appointments not canceled outside of 48 hours will be subject to a charge of 50% of the service booked. Any appointment canceled less than 24 hrs prior to appointment will need to be rescheduled and kept within THREE salon business days in order to avoid a late cancelation fee. No shows will be charged 100% of service booked. Small price increases and policies are subject to change without notice. Should you have any questions or concerns, please do not hesitate to contact Sharon at 404-457-2509. Experience excellence in service when you visit Salon Balisi! 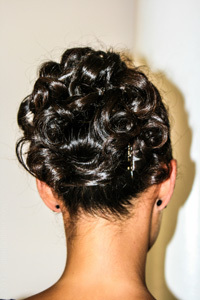 We offer Hair Cutting & Styling, Bridal & Special Occasion Styles, Hair Coloring and more! Your experienced stylist will help you determine the best services for your needs and deliver the kind of quality and value you expect from a professional hair salon. Our location is designed to make your experience enjoyable and leave you feeling wonderful! Check out our complete service menu (through book now! icon on home page) for a complete list of available services. Only the highest quality products, tools and techniques are used to deliver the best service and support your hair needs.